Wow, what a week i’ve had in Australia! I am so glad that I am here, and have honestly been living the dream. No school, no work, no worries, all fun and games. I don’t even know what to start with this post. I feel I have been here for so long already!!! I have met some really cool people, and see some really cool things. Thank goodness, I write what I do daily on my calender or everything would all be mixed up haha. Wed Jan 25th – After an extremely long sleep, Sara headed over to my house as we were going to be spending the day together. 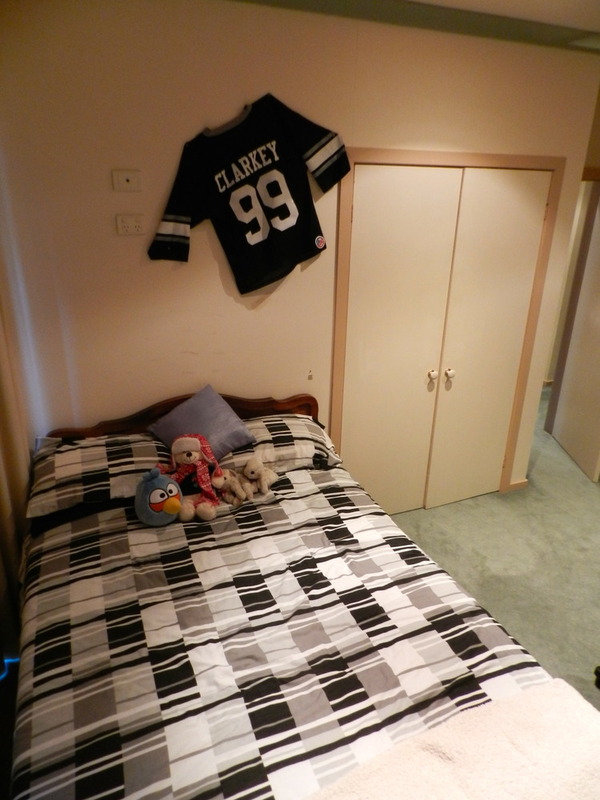 She has been amazing, she has shown me all around my area, the city, and the suburb named Boronia where she lives. I would be lost without her and her family. I feel very much at home when I am around her, and I can’t thank her enough for everything she has done for me. It has been over 7 years since we saw each other in grade 7 & grade 8 back at Bristol Road Middle School. 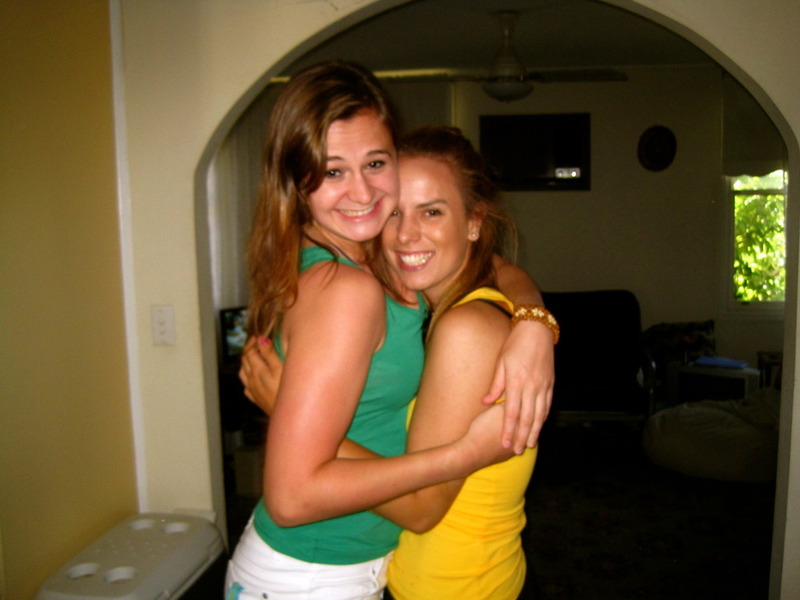 It’s funny how easily we rekindle our friendship, and I definately can now consider her one of my closest friends. We headed to one of the main outlet “shopping centre,” which is a few train stops away from my house. After grabbing our usual Starbucks coffee (White Chocolate Mocha for Sara, and a Skinny Vanilla Latte for myself) we made our way through the mall. I seriously have a shopping problem. I want everything, and thanks to Sara she controls me. 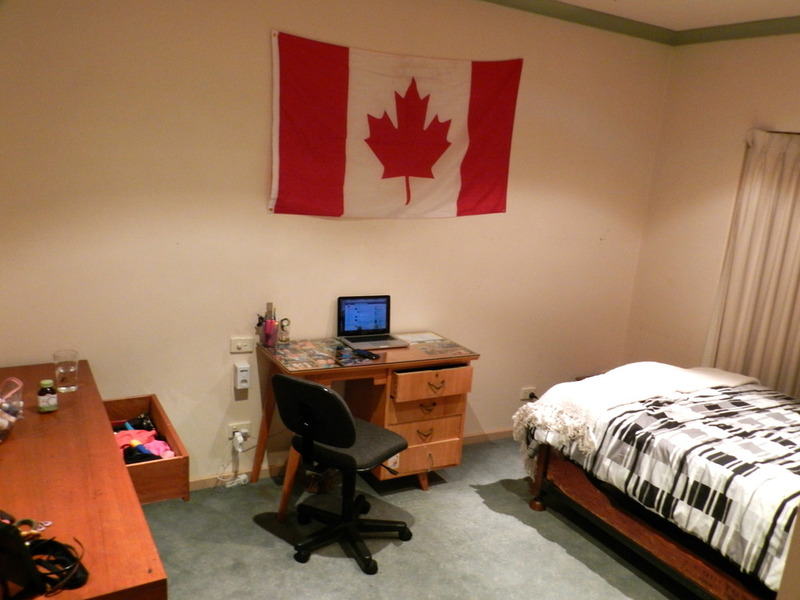 Shopping in Australia and Singapore is a million times better than Canada. I can’t even express how much I am going to miss shopping when I leave here. From all my new clothes purchasing, I think my style has changed. Everything is so laid back and indie-ish. Lovin’ it so much. After a few hours spent in the outlet mall we headed back to her house. She worked in the evening so I went to a movie with her brother. I was astonished when I saw the price of a regular priced movie ticket. $16 for a normal night, and on “cheap tuesdays” it was $11!!!! It is CRAZY, no wonder why minimum wage is so high, or noone would be able to afford anything. We ended up going to see Tower Heist, which has Ben Stiller and Eddie Murphy. It is a crime comedy, and was actually quite good. I’d definately recommend going to see it. After the movie we went and picked Sara from work, and spent the evening catching up and wathcing Easy A.
Thurs Jan 26th – Goodmorning world, it’s AUSTRALIA DAY!!! I’d say I have great trip planning. Not only was I able to be in Singapore on Chinese New Year, I was in Australia for Australia Day and the Australian Open Tennis Championship. This was all not intentionally planned, I may add. Sara and I headed back to the city for a bit of the day to get my phone service set up for the next 5 months. After the confusing of getting everything organized, we were invited to a BBQ a street away from my house. Since we would be drinking for the whole day, we started off pretty slowly. 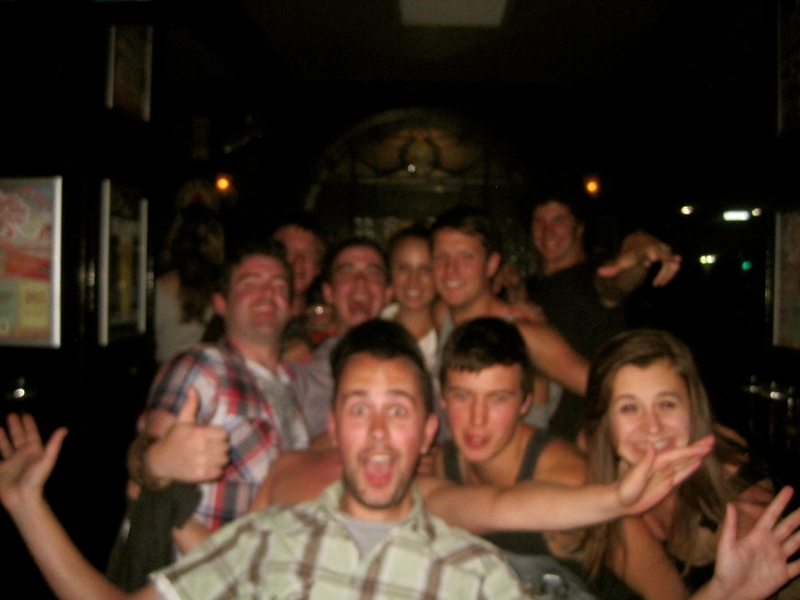 Let’s just say I was definately thrown into the Australian drinking lifestyle full force. It was insane. We ended up spending the majority of our afternoon around the pool and on the patio with about 20 of their friends. 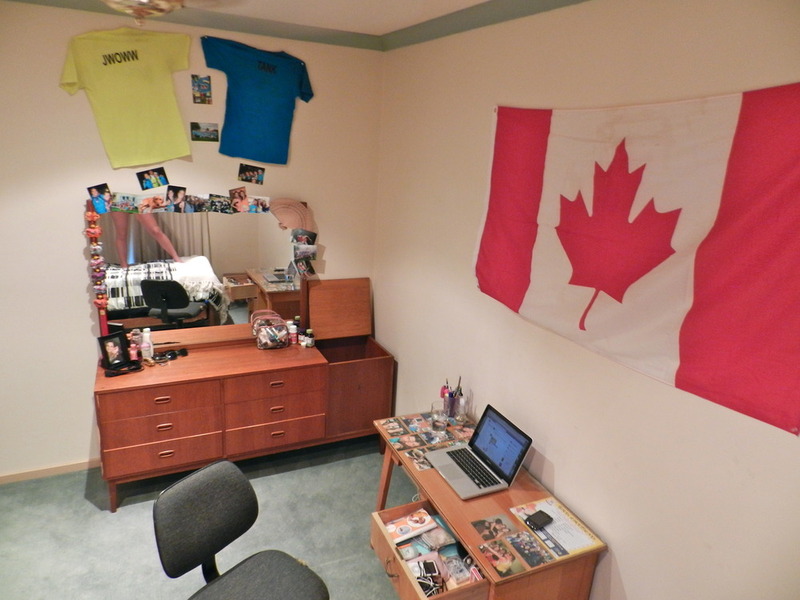 Everyone was super friendly, and loved how we were Canadians. Don’t think I have been hit on so much in my life though. Slightly outrageous if you ask me lol. I’d say it was a pretty good first night out in Melbourne. Fri Jan 27th – It had been a while since I went out downtown, so i’m going to be very honest and say it was a rough morning. I ended up sleeping in til around noon, and it took me a while to get ready for my day ahead. 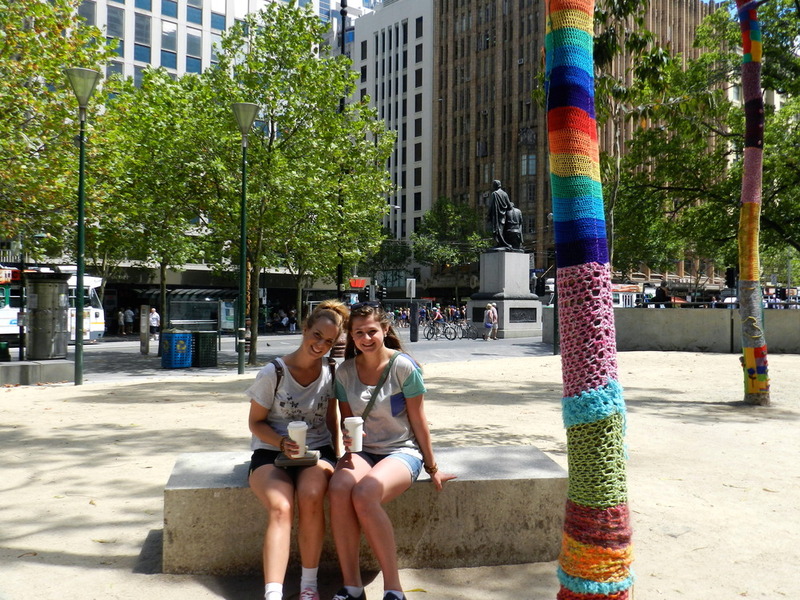 Sara and I ended up going to Flinder’s Street and grabbing Starbucks. I have an addiction to Starbucks, and there are only a few in the area. I love being in the city in Melbourne. Everyone is so friendly, laid back and willing to help you out. I am super excited to spend alot of my time in the city, either kicking back at a cafe, or sitting outside on the grass and doing some school work. Following my day in the city, I headed home to get ready to go to the horse races with my friend Kirby. Kirby had been at Western for the semester beforehand, and we contacted each other that way. Her dad bred one of the horse that was racing that evening so it was really nice to go see “Lilgiggleo” race. He ended up finishing 4th in his “heat” of 8 horses. It was a really busy and full audience, as the fastest horse in the entire world was making an appearance. This horse’s name was Black Caviar and is now on a 17 – 0 – 0 win streak. It was honestly incredible to watch. I didn’t realize how serious and fancy the horse races was. Girls were dressed in formal “prom” style attire, and the men were in full out suits. I was in a nice shirt and a skirt and definately felt a little underdressed 😦 Overall, this was such a fun night out in Melbourne. Horse racing is really big thing around here, and it was awesome to get to go see them for myself! 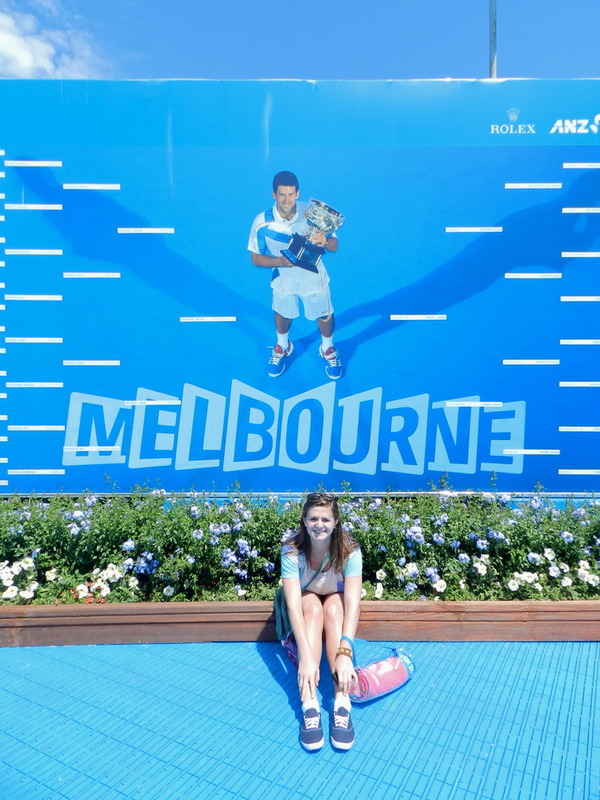 Sat Jan 28th – The day I have been waiting for since I had arrived in Melbourne, and a day most people only can dream about… going to the Australian Open. I remember watching on TV, the various Grand Slam Tennis Tournaments that go on 4 times per year, but I never imagined i’d have the chance to be in the city they were presently being held. Bright and early, I woke myself up so I could have as much time in the city and the open as possible. I am now very aware and comfortable with the train system, and am able to make my way around with ease. 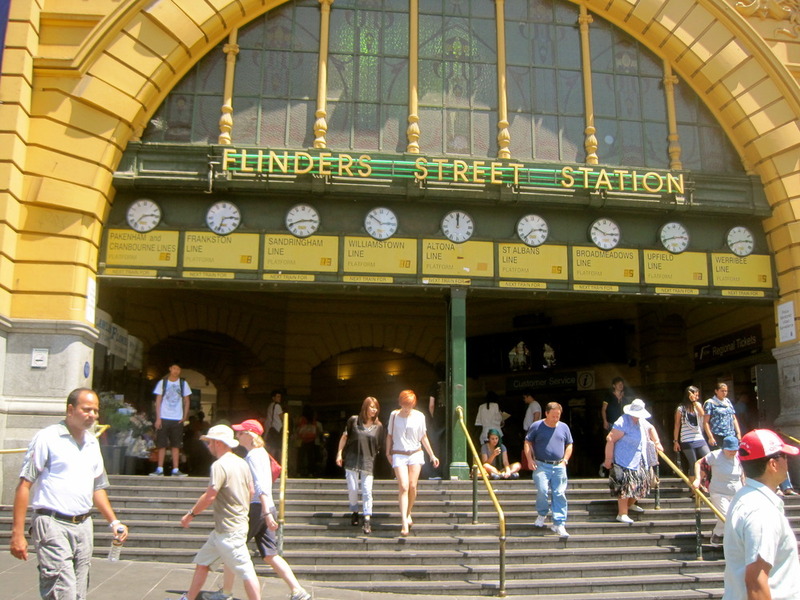 I met Sara at Flinder’s Station, and we grabbed a Starbucks. Yes, most of my meals are Starbucks. 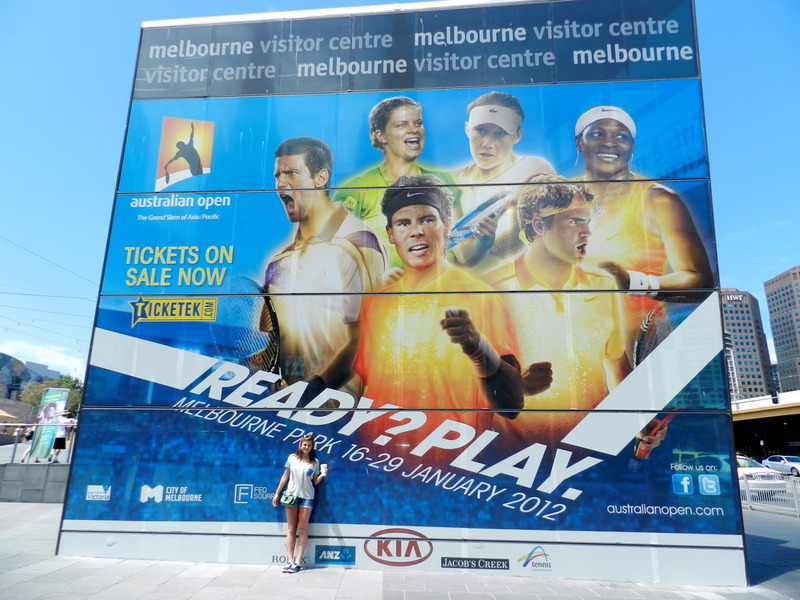 We grabbed a free shuttle to the Rod Laver tram stopped, and began our afternoon. I was in shock and uder amazement when I walked in the front entrance. It was exactly how I imagine the venue’s and ground area to be, and was exactly like what you’d see on TV. We made our way to one of the outdoor courts in hopes that someone was either practising, or warming up. After a few minutes of watching this male tennis player hitting balls to his coach, Sara mentioned she thought it was Rafael Nadal. It took us about 5 minutes to come to the conclusion it was actually him. One of the best male tennis players in the world was only about 50 metres away from me. We started to panic, and the camer started rolling. After about 30 minutes of watching him play, he ended up calling it a day, and before leaving he waved to us. I think I had a small heart attack, and he officially made my day. After cooling off, and calming down a bit, we continues to walk around the outside venues. There were lots of advertisments and companies that are sponsors for this event, who were putting on different activities at various booths. 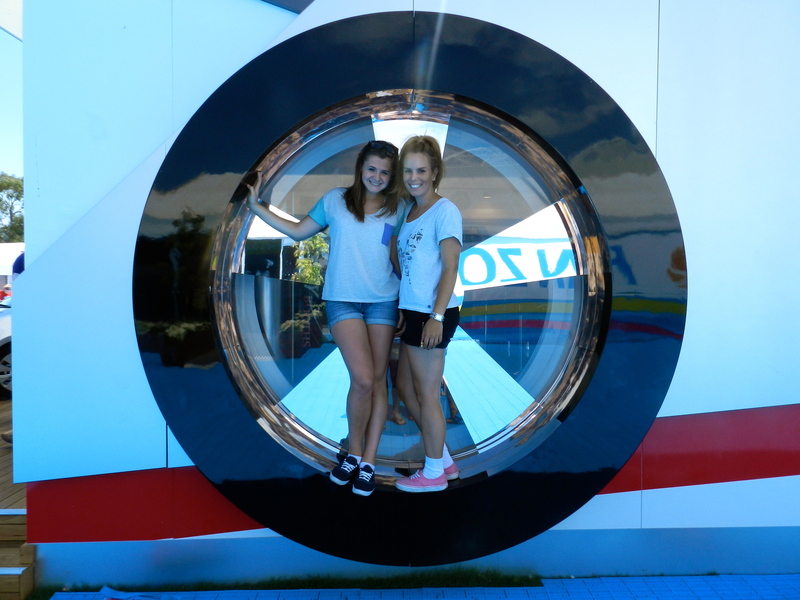 We obviously visited every booth to get the free stuff and take as many pictures as possible. 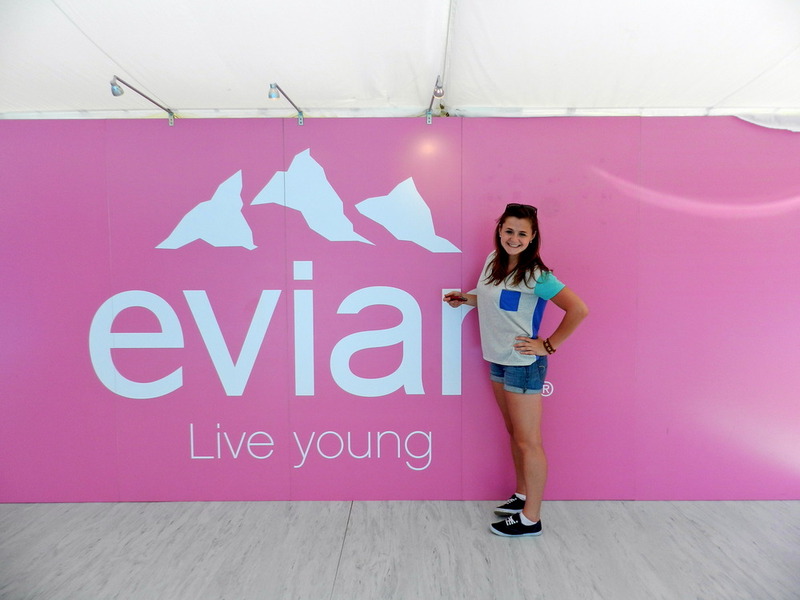 When we went to the Evian booth, they were in the midst of making the world’s longest music video, in hopes it would break the Guiness World’s Record previous length. So it’s going to be really cool when the record is broken to say I was apart of this. It’s also really funny to see other people watch us take pictures at every possible location. It’s obvious we are tourists, so we just laugh and take advantage of it. 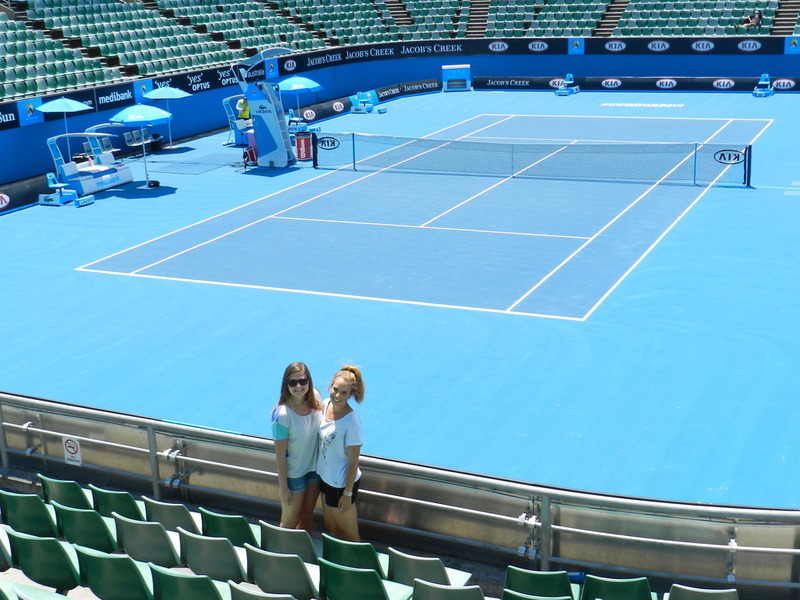 Next stop on our Aussie Open tour was to go to the main court which was in the Rod Laver Arena. This is the venue where the big games were played, and the venue where Djokovic took the championship against Nadal after close to 6 pain staking hours of play. I wasn’t able to stay awake for the whole thing, I don’t understand how those guys can be so fit and play that intense of a sport for so long. I was astonished. 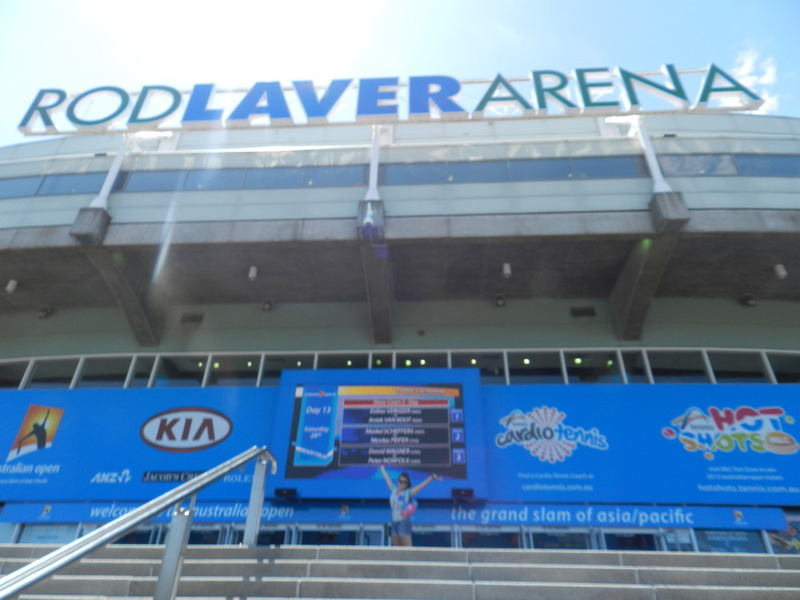 After leaving the Rod Laver Arena I was in heaven. I couldn’t grasp where I was, and what I had seen. 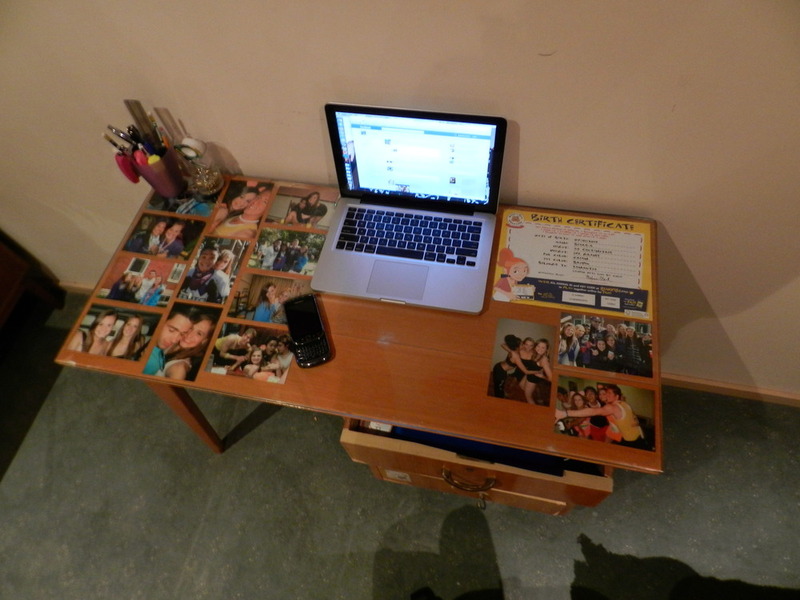 It is definately one of the best memories I have so far, and is something I will never forget. I also couldn’t of asked for a better gal pal to experience this with. I am still in awe by every part of this day. We ended up staying in the city until around 5ish and then I headed home to meet with my newly arrived housemate. I finally wasn’t a loner!! We ended up going to a really ncie Thai restaurant in Williamstown with my “landlord” and my roomates dad. It was such a beautiful night, and it was great we could sit outside. By the time we got home after dinner, it was getting pretty late so it ended up being a very early evening. Sun Jan 28th – Today was a very relaxing day. I met up with a few neighbours and we headed to “Willy” beach. “Willy” beach is a term for Williamstown for all you non Melbournian’s out there. I am practically a local these days. I know my way around this place like the back of my hand. 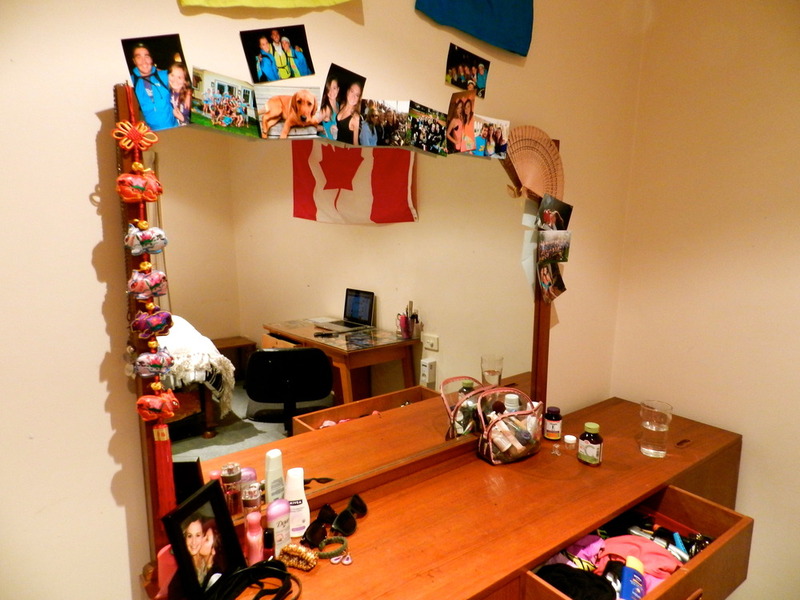 Okay, obvs joking, but I am quite confortable with my surroundings. When we got to the beach it was about 35 degrees and the sun was SCORCHING. I lathered on my sunscreen so we wouldn’t have a repeat of my Indonesian experience. It was such a beautiful day, and I was so content with spending a few hours lounging in the sun after a “hectic” haha week. After witnessing a kid who was causing ruckus on the beach get peppersprayed by a cop we decided to head home. Poor kid, but probably deserved it. suckerrr. I then quickly cleaned myself up of the sand and salt water and made my way via train to Sara’s house for a BBQ. She had befriended a group of German exchange students in the area, so she invited the 15 of them over for the evening. It was really fun, and really nice to meet some other people who were also in exchange. I also had never seen so much food in my life. I was in a food coma until a few hour from now. 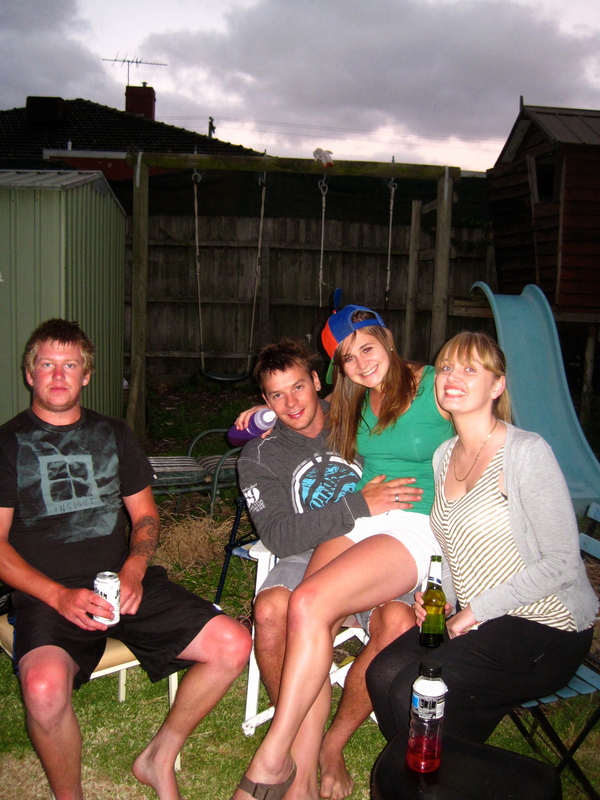 This night was also the final’s for the male’s tennis, so we all snuggled up to the TV, and cheered on our favourite. As mentioned earlier, I wasn’t able to stay awake until the end as it went on for over 5 hours. Mon Jan 29th – Sleeping in til around noon seems to be a habit of mine this week. The extreme heat kept me up alot of the night, so I must of caught up on my sleep in the morning. We got ourselves organized and went to another shopping centre to grab coffee. It’s a daily activity to grab coffee, so don’t be surprised I keep mentioning it. I then made my way to the city to hand out some resumes for jobs, and then headed home. My other roommate Madison finally arrived also with her mom, and we all were able to catch up. 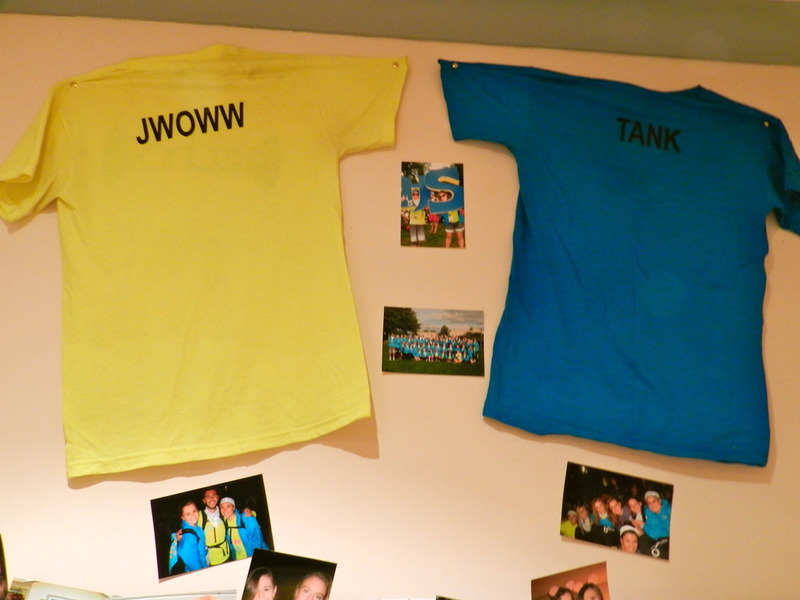 I am so excited for the other two roommates to arrive, it definately looks like we have a good group this semester. Well, this has been quite the first week in Australia. I feel like I have done so much, and see so much. It’s crazy to think my adventure has just started! I am going with Daniela to grab my international concession card for discounts on various things tomorrow in the city, and am not sure what I have planned for the remainder of the day. Maybe hit up the aquariaum, zoo, go skydiving, bungee jumping, shopping… oh the possibilities are endless. Looking at the time right now, I should probably head to bed. My body clock is so messed up lately, with my late nights and varying wake up times. I should probably get a good night sleep for the first time since being home. Well that’s a wrap for now, toodles peeps! Goodbye Justin Yee – I Love You more than life itself. You are fantastic. You must come visit Melbourne. Got called out for being Canadian in the Duty Free shop by an Aussie Mate from Darwin. Sushi lunch… each roll is approximately 6cm in length, and consumed like a hotdog. strange? Grabbed groceries from the Safeway to last me for a few days. This week is looking amazing so far. 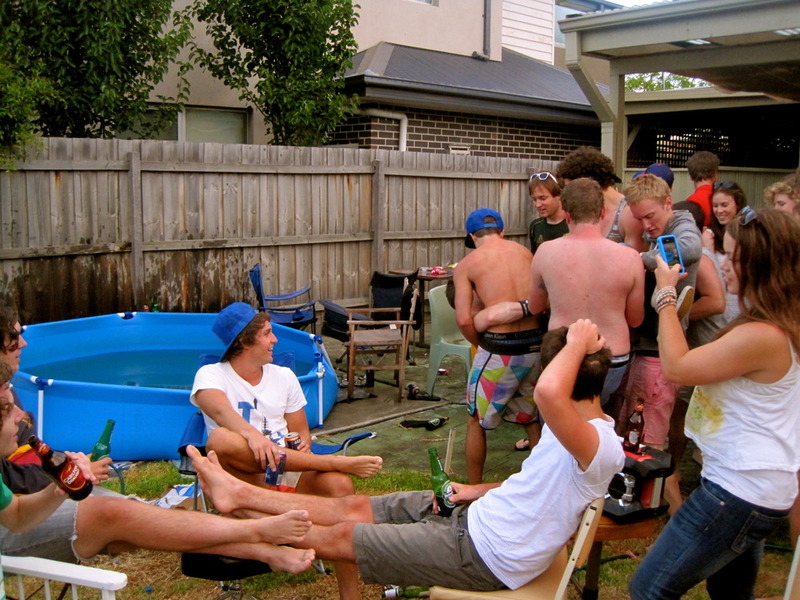 Thursday: Australia Day festivities – BBQ’s, clubs, bar, and the rest is history. 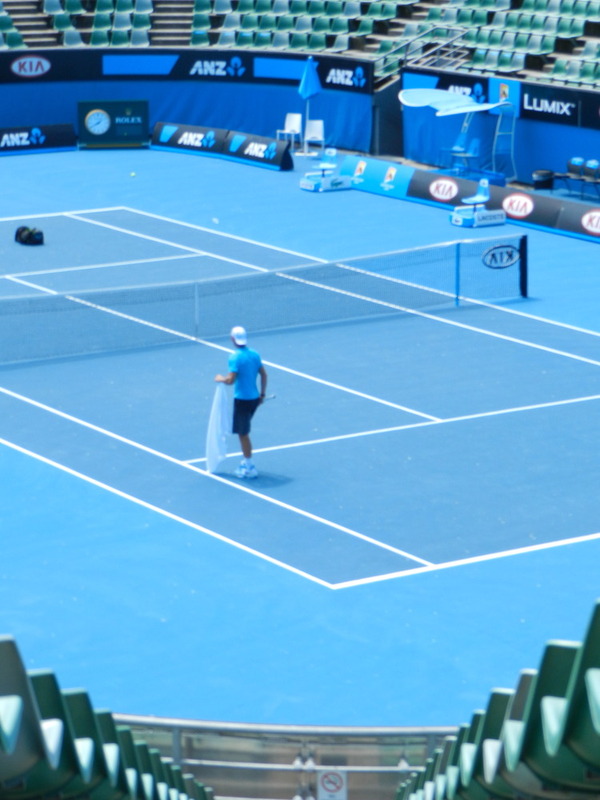 Friday: Australian Open – still in deliberation, but most likely going to happen. Saturday: Downtown possibly w/ some Aussie’s who were on exchange at UWO last sem. Gold Coast.. sure why not? It’s official. Madison and I will be making our way to the Gold Coast to visit the lovely Arthur So on Sat Feb 4th until Fri Feb 10th! For the completely UNREASONABLE, OUTRAGEOUS price of $145 each roundtrip we will be flying from Melbourne to the Gold Coast. 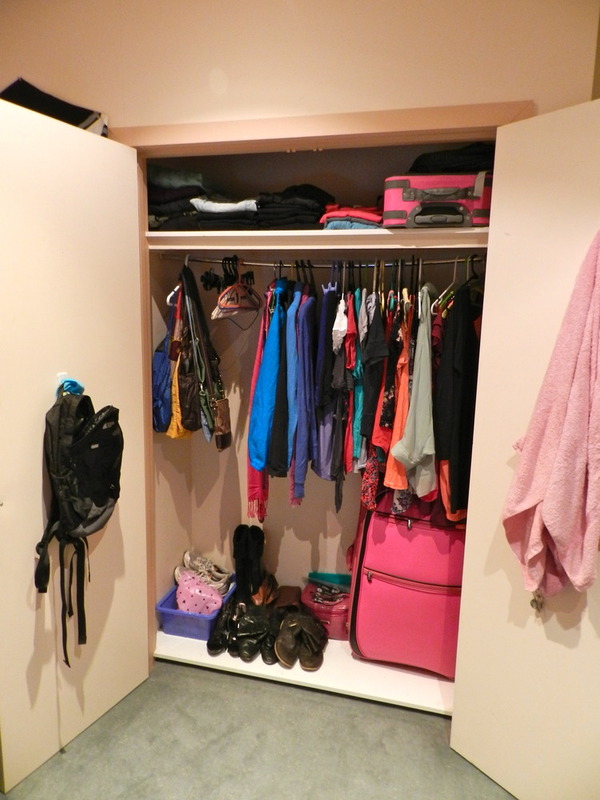 With accomodation at the So residence provided, this makes our to be a very inexpensive trip! Cheap and cheerful is the way to go! Travelling is addicting, and this is not a good thing. The bank account is going to start to hate me in a while. I guess living off of only 1 meal a day might have to suffice. Good for my bank account and the beach body? As for Singapore right now, I said my farewells to Lianne this morning as she is headed to Bintan Island, Indonesia for Chinese New Year. I am really hoping she follows through on her plans and makes it out to Melbourne to visit either during or at the end of her semester at NTU. I am currently sitting in Justin’s dorm room as he is attempting to catch up on the piles and piles of school work that he missed while we were in Indonesia. Apparently people are in school and have actual work to do… hmm beats me =) Time to surf the web some more and find other cool places I want to travel to. Oh my gosh, going trip booking crazy. When I get to Australia on the 24th of January I still have a month of travel time avaliable. With my partner in crime Madison arriving shortly after me, the travel plans have been discussed. 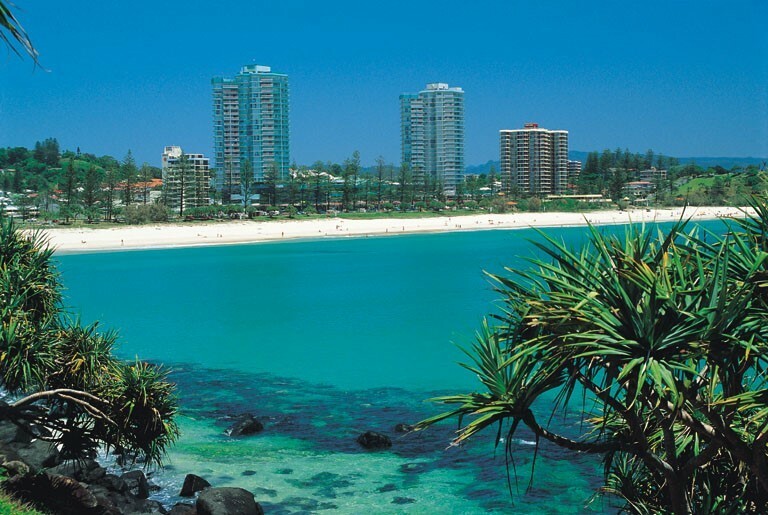 We are thinking of heading to the Gold Coast on a $120 Round Trip airfare on the 4th of February until the 10th of February! I also found a $100 flight to Sydney from Melbourne from the 13th of February until Feb 18th. This may need to happen as well. I am so excited to get to Aussie now. Can time just speed up and it be Monday already?????? ?